Who said U.S. textbooks don’t teach enough African history? Black Twitter remembers learning a thing or two about what life was like when much of Africa was under European colonial rule during the middle of the 20th century. 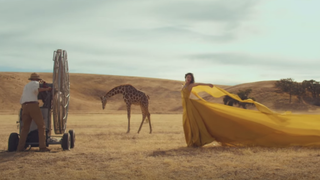 So when Taylor Swift released her music video for the song “Wildest Dreams,” which features her frolicking alongside wild animals in 1950s Africa, something didn’t seem right. She plays a white actress on the set of a movie. She’s in beautiful dresses, the scenery is breathtaking, but the only problem is, there aren’t any black Africans in the setting. But she packages our continent as the backdrop for her romantic songs devoid of any African person or storyline, and she sets the video in a time when the people depicted by Swift and her co-stars killed, dehumanized and traumatized millions of Africans. That is beyond problematic. Black (and white) people on Twitter echoed those concerns. The video’s director, Joseph Khan, emailed NPR and defended his work. He explained that it would have been historically inaccurate for him to cast black Africans as production crew in the fake movie that was portrayed in the video. I understand his point, but I also understand the initial concern that Africa was being objectified by European colonizers who refused to see the humanity in its people. That Swift (probably not the best person to be in the middle of this storm) was thought to be glamorizing that period struck a sensitive chord.